The bride wanted only black and white, so that's what she got...and it looked stunning! She also wanted the accent of cool & funky black feathers added to different areas. 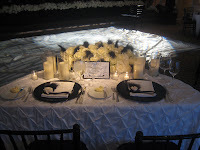 All the containers used were a slick black, including the candelabra with hanging black crystals. 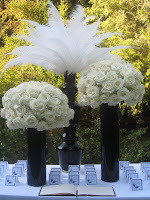 The bridesmaids & groomsmen were all adorned with all white flowers & black feather accents, while the bride & groom had the accent of white feathers. The gazebo had a clean and lush square display of packed white roses and hydrangea, with complimenting aisle pieces to create a focal point in the ceremony area. 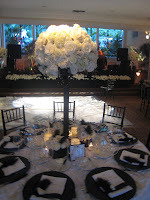 The wedding was held at the beautiful Hotel Bel Air. This past weekend The Hidden Garden designed the most beautiful wedding with Mary Dann and her team at the Trump in Palos Verdes. Jennifer and Jian were looking for something elegant, over the top and gorgeous. Flowers ranging in shades of ivory to white were the request by our gorgeous (and super sweet) bride! Incorporating the use of peonies (a favorite), white hydrangea and garden roses...our look was achieved! Crystals, shapely glass vases and abundance of flowers set the tone for a perfect evening! There is a very resourceful site for all our Brides to be called Here Comes the Guide. If you are getting married...I'm sure you have heard of it! The Hidden Garden just joined on as a preferred vendor on their site. I have to say their qualification process is very extensive. They do a VERY thorough background check with many references from past clients and other vendors in the industry prior to accepting you into their organization. Check out our new listing and if you have time you should browse the site for other vendors. 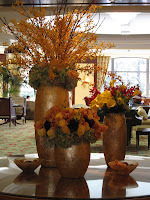 The Hidden Garden is so honored to have been selected to be a part of such a beautiful hotel. 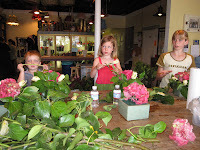 We had an amazing turn out for our Mother's Day floral classes over the weekend. 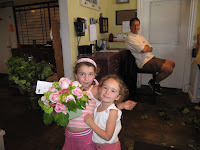 It was so cute seeing the little ones (and even the dads) making arrangements for Mom. I'm sure "Mom" was thrilled with the beautiful designs their little ones made them. 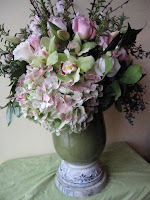 Each arrangement was filled with roses, hydrangea, lilac, viburnum and cymbidium orchids. What's not to love! It's almost here.....the day to show mom how much you love her!! Why not show her your love with a beautiful arrangement from The Hidden Garden. There are so many beautiful flowers in season right now! Mother Nature hasn't graced us with such an amazing selection for this holiday in a couple years. All my favorites are still around for this holiday. 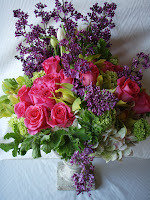 Flowers such as lilac, viburnum, dogwood......just the most breathtaking combination! Today we had the cutest baby shower at The Peninsula in Beverly Hills. 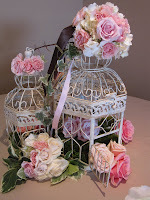 Linda Howard, from Sensational Celebrations helped us design these adorable bird cage floral vignettes for each of the tables. It's a cute twist on a very simple idea. We collected some antiqued bird cages and filled the interior of each cage with mood moss and rose heads. The outside of each cage was adorned with "oasis cages" and filled with an array of pink mojaleka sweet heart roses, viburnum, pink heaven rose and ivy.